This 128-page chapter book with full-color interactive illustrations throughout features Gamora from Guardians of the Galaxy in a brand-new adventure! 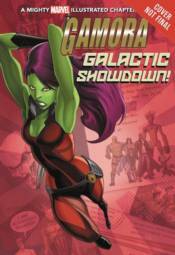 The last of the Zen-Whoberirace, Gamora was adopted by the villainous Thanos and raised as an assassin. But, Gamora turned on her adopted father and now uses her abilities to help those who cannot help themselves as part of the Guardians of the Galaxy!